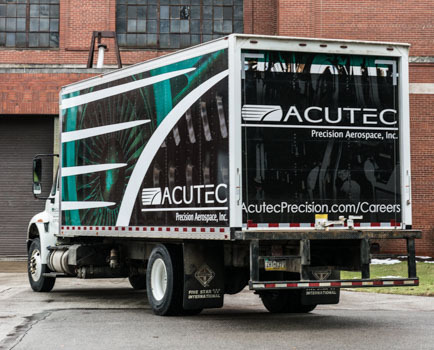 Acutec Unveils New Truck Design | Acutec Precision Aerospace, Inc.
MEADVILLE, PA – In honor of its 30th anniversary, Acutec Precision Aerospace, Inc. unveiled its new truck design. 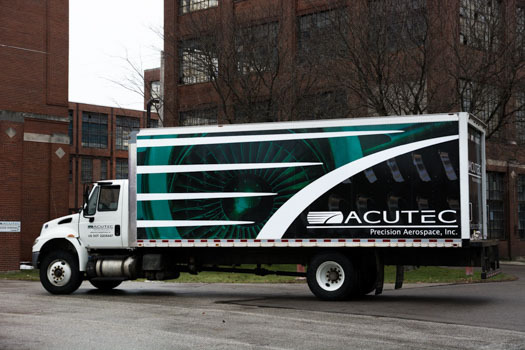 The 26-foot sides sport images of jet engines and their components wrapped in the distinctive Acutec green and black colors. The front view of a Boeing C17 jet engine dominates this new design. Acutec manufactures several components that are used on this military transport aircraft. When not in regular delivery use from the Meadville and Saegertown facilities, the truck will be seen assisting at various community events. The truck will make its public debut collecting Christmas Trees from the City of Meadville on Saturday, January 13th.